Lloyd's Investment Blog: Which is the "Most Promising" Search Engine--Google, Yahoo or MSN? Which is the "Most Promising" Search Engine--Google, Yahoo or MSN? Frequently cited studies by Nielsen NetRatings (usage stats: Google 46.2%, Yahoo 22.5%, MSN 12.6%, July 2005) and comScore Media Metrix (usage stats: Google 36.5%, Yahoo 30.5%, MSN 15.5%, July 2005), as conveniently summarized by SearchEngineWatch, indicate that Google owns the leading search engine, followed by Yahoo, MSN, AOL, Ask Jeeves and others. While I have no reason to question the conclusions of these studies, I generally like to run an independent check on the analysis of others. 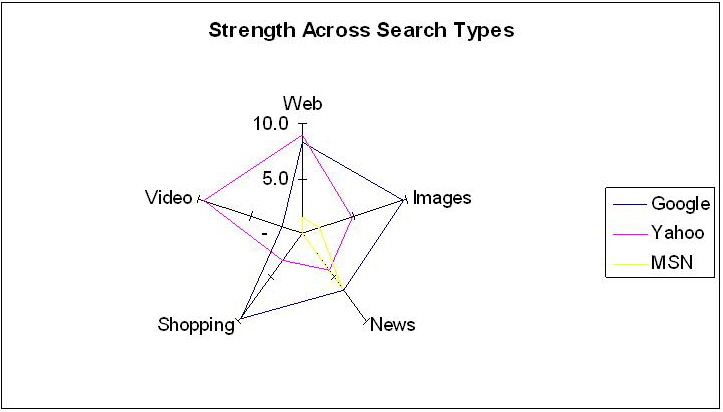 Below I summarize a simple search engine study I have conducted on Google, Yahoo and MSN, covering the primary search types offered--Web, images, news, shopping, and video. Whereas most studies focus on usage statistics (i.e., which search engine do people use the most? ), it is also interesting (and simpler) to build a quick study around plurality (i.e., which search engine returns the most hits?). The rationale for approaching the study this way is that the most comprehensive search engine (highest plurality) will also tend to have more relevant search results embedded somewhere amongst the many hits. Using sorting algorithms, engineers will over time discover more relevant and useful ways to organize and present the massive amount of information uncovered by their search bots, giving an advantage to the search engine with the widest net. Higher relevancy, in turn, leads to higher user satisfaction and greater usage. In other words, while current usage stats provide a picture of who's popular and who's not today, plurality (i.e., raw number of search results) offers a forward-looking indication of which search engine shows the most promise of becoming more popular in the future. For lack of a better way to choose sample search queries for a plurality study, I select the top seven searches from the current "top mover" listings on both Google's Zeitgeist (for the week ending January 16) and Yahoo's Buzz (for January 19). For example, in position #5 on Zeitgeist is "Angelina Jolie pregnant," which returns 2.55 million, 3.22 million and 1.33 million hits on Google, Yahoo and MSN, respectively. For this particular search query, I assign a rating of 10.0 to Yahoo because Yahoo's Web search returns the greatest number of hits; Google receives a proportionately lower rating of 7.9 and MSN gets a rating of 4.1, based on the smaller number of hits their Web search engines return. In addition to searching on the 14 queries cited above , I conduct Web searches on the words "Google," "Yahoo" and "MSN," again querying each of the three search engines. I display results for all 17 sample search queries in the bar chart to the right above. Observe that for this small sample, Yahoo is ahead in 11 of the 17 cases, while Google leads in the remaining six. I also remark that Google's Web search on its own name, "Google," returns 874 million hits, versus the lesser figure of 514 million hits for a Google Web search on its primary competitor's name, "Yahoo"; similarly, Yahoo's Web search returns more hits on its own name, "Yahoo" (816 million), than on its competitor's name, "Google" (499 million). Apparently, these two competing search engines have a knack for finding more occurrences of their own name, while curiously overlooking their competitor's! 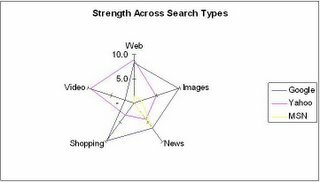 Using the 17 sample search queries, I conduct the same study on the three search engines across the five search types: Web, images, news, shopping, and video. 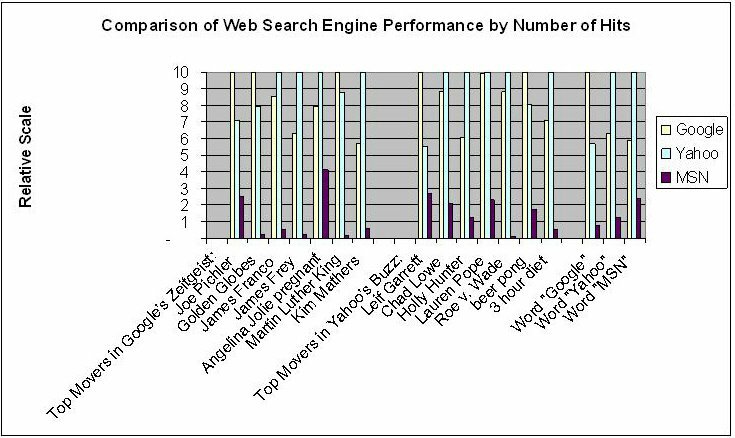 Based on the relative rating methodology described above, I find that Google returns the most hits for images, news and shopping, while Yahoo returns the most hits for Web and video searches. MSN ends up a distant third in all search types, except for news, where it places second behind Google. 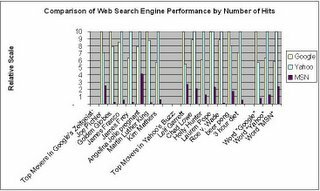 Web search: Contrary to usage data showing Google ahead of Yahoo, it appears that Yahoo's Web search is able to generate in a fairly consistent way measurably more results than Google's Web search. Assuming that relevancy scales with sheer number of results, Yahoo appears to have the edge here. Images search: I am somewhat surprised to find that Google comes up with more images than Yahoo, especially in light of Yahoo's historical attention to picture-ads (versus Google's focus on text-ads) and acquisition of photo-sharing site Flickr. News search: Google's automated aggregation of 4,500 news sources apparently gives it an advantage here, while Yahoo historically has given priority to hand-picking of content by human editors. Yahoo's recent (still in beta) listing of news blog results alongside other news search results could possibly help to close the gap. MSN's strong showing could be related to its MSNBC news partnership with NBC. Shopping search: Google's Froogle appears to have developed a clear edge over Yahoo Shopping, particularly in the area of comparison shopping. Video search: Yahoo leads in this brand new search area, with Google still in early beta. Video search will become increasingly important as fast broadband connections become more widespread. As I see it, Yahoo, which began as a content directory and is a relative late-comer in the home-grown, in-house search business, has some chance of catching up in usage stats (popularity) with Google, by leveraging its (Yahoo's, according to my survey) leading position in Web search plurality. However, at this stage in the evolution of the Web, with "search" and "Google" having become largely synonymous in the public's eye, Google is in the driver's seat. Taking a broader view, I consider both companies attractive long-term investments, based on their enviable positions at the center of the Internet universe, strong balance sheets, and tremendous growth potential. Just as Amazon and eBay's businesses have grown more similar to one another over the years, my guess is that "content king" Yahoo and "search queen" Google will find themselves treading more and more on each other's turf in the future. I close with a comment on Google and Yahoo's stock prices. 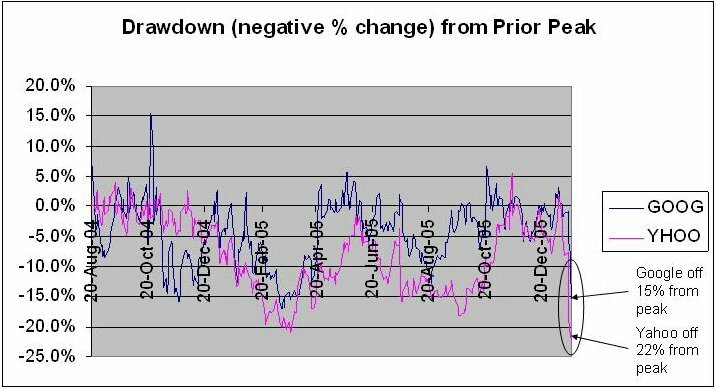 As shown in the graph to the right, following Google's IPO in August 2004, its largest percentage price drawdown peak-to-valley was 17% during last year's slump in the middle of March. At the close of this past week's sell-off, triggered by Yahoo's weak earnings report and fallout from Google's rebuffing of a Justice Department subpoena requesting search engine data, Google (GOOG, $399.46) is off 15% from its all-time high of $471.63 on January 11. Yahoo (YHOO, $33.74) has sagged even more, now sitting 22% below its recent high of $43.21 on January 6. From a short-term perspective, both Google and Yahoo have retreated into comparatively attractive price ranges. Based on analyst estimates (from Thomson First Call), Google now trades at PE ratios of 68 (on $5.90 estimated 2005 earnings), 46 (on $8.76 estimated 2006 earnings), and 35 (on $11.44 estimated 2007 earnings). The analogous PE ratios for Yahoo are 58 (on $0.58 2005 earnings), 44 (on $0.76 estimated 2006 earnings), and 35 (on $0.96 estimated 2007 earnings). These are the lowest PE ratios yet seen for these two Internet high-fliers, though I suspect the near-term price bottom may still be somewhat lower. Hey there. Can I ask if you know of any sites like this one (single parent dating) where I can meet other people to talk about single parent dating? Hey Lloyd - Boy do I disagree with you on some key issues about those big Search Engines, especially Google. Are you aware of their big potential legal and public relation liabilities? 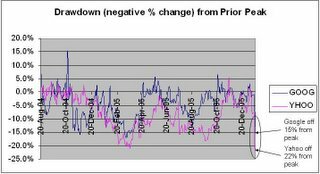 Here is an interesting analysis about Google's big drop Friday. For How Long Can Google Run Ahead of the Pack? Office REITs: Fill 'er Up, Please!